My children’s last great-grandparent has died. I wasn’t sure what to say about it for some time, since I am dealing with my own emotions around losing my grandmother, but it seems like a good time to write about how we teach our children to say goodbye, and how important it is. I was terrified of death throughout most of my life, until two retrospectively wonderful things happened to me. First, my maternal grandmother died, and I had an opportunity to visit with her in her final weeks, chatting the small amount that she was able, and being upfront with her, which she was good at. As I left her for the last time, I told her I loved her, and said, frankly, “Grandma, I’m scared”. She blinked her eyelids at me and I remember the softness of her hand on my arm. She said, “Me too, honey, but it’ll be all right.” Then I left. Two years later, I was fortunate to be with my family at my paternal grandfather’s bedside as he died. We knew his departure was imminent, and stood around holding his hands and talking to him. My grandmother asked him if he could hear us and he said yes. Then in a moment he gently exclaimed, “Well how ‘bout that!”, exhaled a slow last breath, and I watched as the colour drained from his face and then his hands. His hand slowly grew cold in mine, and he was gone. Despite their morbid nature, these events were some of the most important of my life, as I was able not only to say goodbye, but to witness the surprisingly non-threatening simplicity of non-violent death. My children’s experience of death really began with the loss of their various pets and livestock-pets, some shockingly and unexpectedly of heart-failure and by mink-attack, and some by euthanasia. All of these happened in my kids’ presence, and our son took upon himself the enormously brave and sad task of euthanizing his own beloved rat, who was dying of cancer. Mourning is a natural thing for humans to do, and seemed to require no guidance from us. I will never forget the beautifully long death-song sung by my preschooler-daughter as she instinctively picked flowers and laid them round and round the grave of her dog. Just shortly after helping to pile the dirt onto the body of her beloved Juniper, still red in her eyes from sorrow, she dealt with her feelings in her own perfect way. When humans die, there are often so many family members to consider that memorial services and goodbyes can be strange or inaccessible to children, but the death of pets is a somewhat easier way to involve them in the actual death and burial or cremation process. Of course, it’s important to make our own personal goodbyes with humans, too. Three years ago my father died unexpectedly, and my first instinct was to rush my kids in to the hospital with me. They didn’t want to look at him, and neither did I – he looked like he had suffered, and his face was strained with what seemed to have been a traumatic death. To be honest, it was very hard. But my kids did look. It’s a big deal to see a real dead person and to discover that, while utterly heartbreaking to consider the loss of that person, it’s not actually scary. So when my grandmother died in January, I brought my son with me, and he had an opportunity to sit with her and to hold her hand, to see how small she had become, and to say goodbye. He remarked that it’s weird to say goodbye to someone who’s not there anymore, and in that alone he grew that day. Death is an opportunity for growth. It’s important that we say goodbye when the person we’re talking to is gone, so that we feel the weight and the lightness of their absence, and begin to accept it. It’s important that we embrace these difficult moments so that we can live without fear of them. It’s important that we welcome death and loss and grieving as part of our every day, so that they don’t become burdensome. I still grieve for the loss of many people I love – some dead and some living. But that grief has to be a part of my living journey; not a curse to fear or hide from. I am glad my children are learning to say goodbye. I was also able to arrange a special goodbye for our family, after my grandmother’s death. We spent many hours in her house – just the four of us. 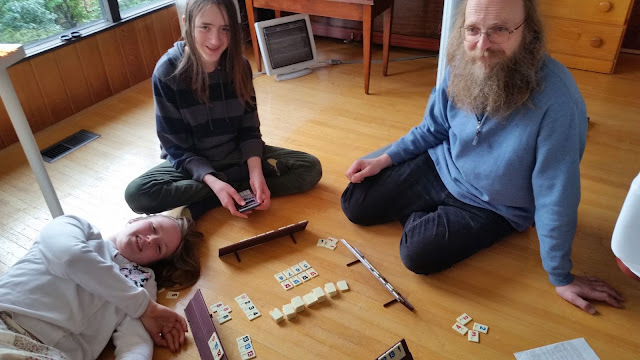 We played her favourite game and talked about her, my grandfather, and my father, who are all gone, now. We explored the house and looked at the many photos, the family tree, and some things and places that have memories attached to them. But we also did mundane things, like cook our lunch and do some studying at the kitchen table. We lounged around on the floor, adjusting our minds to the idea of our shifted family. We said goodbye in so many ways, and we pulled each other in, too, closing the gap left by her absence. Mourning is a natural thing to do. So we make time and space for it, have patience for each other to do it in our own unique ways, and know we’ll find each other back again in love and dream and memory. 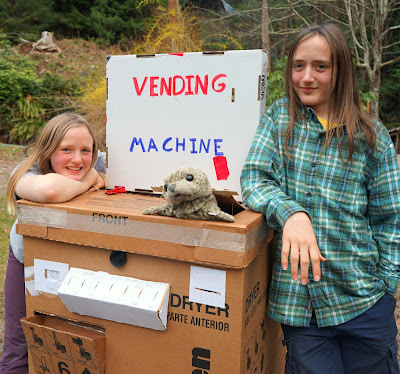 Before I could get rid of this giant cardboard box, my kids hatched a plan to turn it into a vending machine. And over the weekend, with this unexpected device, they proceeded to make many many customers and bystanders exceedingly happy. So happy, in fact, that they had telephone interviews with the local paper, and created video compilations of their work. The odd thing is that everybody seems to want to know how much money they made... and they don't know! They didn't bother to count. The net cash haul is somewhere around $20 for a couple of days of hard work, but that was never the goal. They just wanted to be creative, have fun, and make people happy. They frequently delivered cash to penniless customers, in fact, because it wouldn't be nice for people to feel left out. Quarters and dollars and fake plastic coins would appear in the mouth of the puppet, along with a surprise in the delivery hopper, or might even shoot right out of the coin-slots! I would never have thought of creating a vending machine, never mind one operated by a generous seal (and sometimes dog) puppet, and definitely wouldn't have imagined it to be non-financially motivated. I loved their idea, and love to see my kids growing up and out in the world with their own ingenuity and making a difference, there. I sit down with a new group of kids, their wide eyes looking up at me, waiting to see what we'll be doing for the day. It sounds idyllic, but it's not. As a teacher, this is my greatest challenge: to spark genuine curiosity in kids and adults who have lost theirs. The first thing I'm going to do with these kids will shake them up entirely. I'm going to ask them what they'd like to do. "Well what is there to do?" They'll ask me. And I'll tell them there is everything. I'll tell them about all the fun resources we have, that we can go anywhere we can get to, do anything we would like to do, and that I'll support their adventures with materials, enthusiasm, and information as well as I can, as long as everybody remains safe and happy. They will look at me blankly. They won't even get up and look around. They won't know what to do with this information, and will start exploring the boundaries of the new idea. "But teacher, I thought we're going to learn about the environment." "My Mom said don't get my raincoat dirty." Etcetera. It's going to take a few days of freedom for these kids to simply understand that they have free will. It will take many more days of experimenting, boundary-pushing, accidents and tentative steps outside of their comfort zones for these kids to start doing the most natural thing for children to do: explore. Exploration is how learning happens. It's how a baby learns to take its first steps, to eat, and to speak. It's how an artist, scientist or inventor develops anything new. Even when we've been taught the facts, we don't truly understand them until we've tested them. Exploration is how we develop as individuals and as a species, and we literally can't live without it. And so much of the way we're teaching, parenting, and entertaining our children is killing their ability to explore. We're crippling our children. As Neil deGrasse Tyson points out in this fabulous lecture, kids are born scientists, and the first thing we do as they start wreaking havoc with their scientific exploration is to stop them, because the chaos is inconvenient for us. He also says "we don't have enough parents who understand or know how to value the inquisitive nature of their own kids, because they want to keep order in their households." Well we parents were kids once, too. We were kids whose parents told us not to get our clothes dirty and frowned on us destroying the crayons, whose teachers reprimanded us for drawing in our workbooks, re-configuring the scissors, or for staring out the window at the leaves falling. We were kids whose curiosity was crushed and crushed and crumpled into tiny boxes so that now we find it satisfying to see things work the way they are supposed to work. And we haul our kids off the playgrounds and stuff them into cute little chairs with perfectly ordered science experiments just waiting for them, so we hope they'll excel at physics although we just denied them the greatest physics and social experiment of the day: the playground. Our kids will grow up to watch flat earth conspiracy videos on YouTube because they learned really early that science is for people who sit in chairs and follow instructions and intrinsically they knew that was wrong, so they lost faith in science. They lost faith in themselves as scientists, because we did. We didn't celebrate their efforts to run so fast they disappeared; we told them it was impossible. We told them scientists could prove them wrong. We held science up as an impenetrable wall to stop their exploration, and we killed science in our children. Then, because their learning wasn't recognized, they lost faith in themselves as learners; as explorers; as intelligent. They lost faith in themselves. This has been going on for generations, and when are we going to wake up? Our job as parents and teachers isn't to provide facts and order and schooling. Our job is to not have all the answers, but to just be busy exploring, ourselves. Our job is to let our kids find the answers we didn't even know existed. Our job, as Neil deGrasse Tyson also says, is to get out of our kids' way. We can, in fact, follow our children's curiosity and begin to break this terrible downward spiral our society is careening along. It's going to take some patience, because exploration takes time. It's going to take patience, because exploration is messy. There won't be any time for classes and tutors and homework. Only life. And it's going to be one hell of a disorderly life. But an interesting one. And a rewarding one. My eight year old daughter eating a bowl of cornflakes, pepperoni, snap peas, milk and lemon juice. It apparently tasted too awful for a second bite. A waste of food, which I would have attempted to avert, had I realized what she was concocting, but a self-directed experiment she learned a lot from, and never forgot. She is a wonderful cook! Unschoolers, life-learners, de-schoolers and democratic educators are going there. Not fast enough, but it's happening. I can't wait to see where we go from here!